Finding accommodation for a large family can be challenging and expensive, but if you’re hoping to visit Ljubljana we have the solution. Munda House is a 5 bedroom apartment located in central Ljubljana, just steps from the Old Town. This historic, turn of the century building has a colorful past that’s as interesting as its bright interior, creating not just a place to sleep but a place to embrace the culture and history of the city. Munda House is full of local art, carefully conceived details, and the best beds in the city. There are not many apartments in Ljubljana, or any city for that matter, that can boast 5 good sized bedrooms, but this one in Munda House does. We feel this apartment is the ideal destination for families and groups of friends because it can easily accommodate 16 guests, or more by request. It’s the perfect place to come for a family get-together or reunion while surrounded by the beauty of Ljubljana. The location is perfect, accessible by car but right on the edge of the Old Town and the pedestrian-only streets, so it’s quiet but only steps to great restaurants, theaters and of course everything else that the Old Town has to offer. Many of our Fine Ljubljana Apartments have interesting histories – we find it makes your stay all the more meaningful when you know and understand the apartment’s history, especially considering all the nods to the building’s heritage that you’ll find when staying here. Munda House was built in 1895 following an earthquake in Ljubljana that destroyed many of the houses in the center. A well known and respected Ljubljana citizen, named Doctor Franz Munda, built this house along with many others around the city. Today, Munda House is one of only a few remaining, and Doctor Munda himself lived in a house that once stood adjacent to this one. On the site of Munda House was one of the first gyms in Ljubljana. Dr. Munda was a keen gymnast himself and a member of the first Slovenian gymnastics society during a time when sports clubs and fitness awareness were emerging around the country. Today the apartment is owned by another family who are proudly presenting the building’s origins with a number of nods to gymnastics and a careful attention to the design and furnishings in every room. 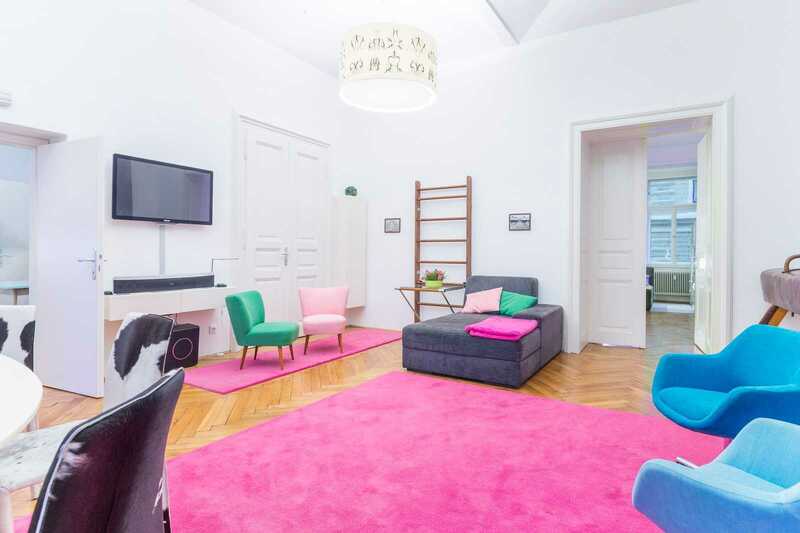 The owner handpicked or self designed every detail in this 5 bedroom Ljubljana apartment so that every room represented Slovenian heritage and culture in some way. 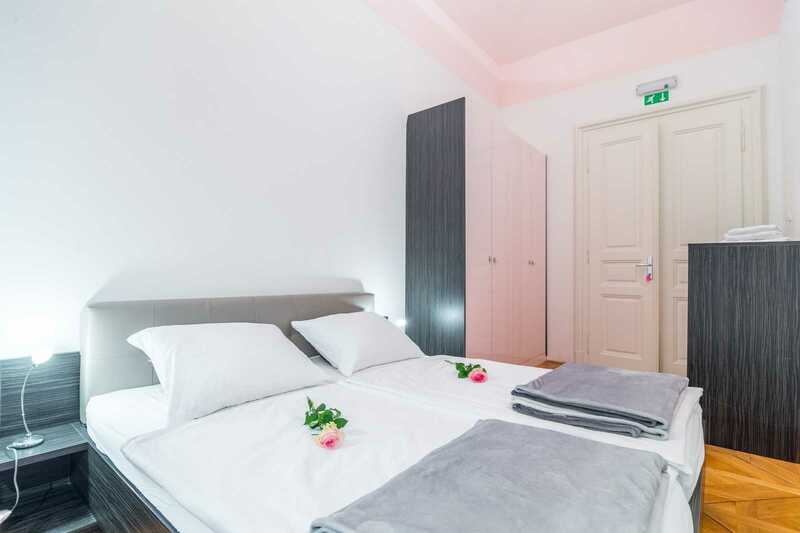 Situated just 30 meters from the entrance of this accommodation in Ljubljana is the city’s Old Town so you’ll be within a stone’s throw of the historic center. But this isn’t the only advantage – the apartment is located on a narrow, one way street making it accessible by car (perfect for unloading all of your luggage) but also quiet so you get the best of both worlds. The pedestrian area, as well as restaurants, cafes, galleries and the open-air theatre are all within a couple minutes walk. If you look up above the main entrance doors to the building you’ll see the letter M for Munda. As you enter the apartment itself you’ll find a combination of styles and design where the mostly light colored walls are accentuated with bright bursts of color. The living room is a prime example with its vibrant pink carpets and cowhide patterned dining chairs. Here you’ll find some of those gymnastic references such as the original professional pommel horse, a wall hanging table made out of a sports wall ladder, and hand rings hanging from the ceiling above the dining table. Some of the books include a gymnastics hand book as well as many books about Slovenia. At the dining end of the living room the egg-shaped dining table was handcrafted and the windows overlook Ferantov Garden, a small park named for Dr. Munda’s housekeeper, Mr. Ferant. The three big round lights hanging from the ceiling are all custom made by Svetila Slovenska Bistrica, and one of the lights has a gymnastics design imprint. From the living room a door leads through to the spacious kitchen which has a kind of modern retro feel to it. The kitchen counter and cabinets were made by carpenter Golob, another Slovenian craftsman. The old kitchen table was renovated with the same materials used for the kitchen counter, as well as the seating bench in the kitchen; both were renovated to fit in this space. On the right of the photo below you can see the blue fridge. 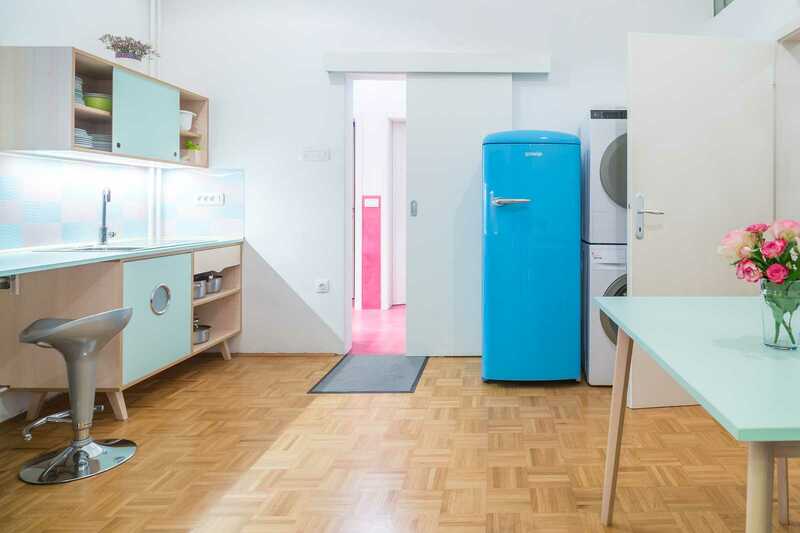 This fridge was made by Slovenian kitchenware producer Gorenje and is one of the retro features of the kitchen. The kitchen comes with everything a large family or group will need, including appliances and entire cookware like plates, pots, pans, cups, bowls and many different glasses. Next to the fridge are also a washing and drying machine, not visible on the photo. The 5 bedrooms are all spacious, bright and inviting so all members of your group will feel at home here. Each bedroom has been named for a Slovenian town, representing the old, traditional crafts for which these towns are famous. In each bedroom there are custom made mattresses by Slovenian furniture maker, Meblo. The mattresses are made only of cotton, as are the pillows, duvets and linens. Sheets and covers are made of high quality cotton satin so are light and comfortable. The Master Bedroom is named Idrija, a town known for traditional lace making and mining, so the master bedroom has references to lace. This is the only room with a double bed, so no fighting over who gets this bedroom! The remaining four bedrooms all have bunk beds so these are perfect for kids but are also comfortable and perfectly suitable for adults also. These are not just any bunk beds – they are high quality furniture made by a very experienced Slovenian craftsman who specializes in creating bunk beds. Three of these bunks also have a pull-out (trundle) bed underneath. Bedroom Radovljica – Radovljica is well known for gingerbread and in this bedroom you can see two ginger purple hearts on the wall, specially made for this bedroom. The remaining two bedrooms are named Ribnica and Planica. Ribnica is a popular tourist destination in Slovenia, home to wooden handicrafts and the home of the first Slovenian tradesman, while Planica is home to the famous ski jump and has hosted world cup ski jumping events. Every morning during your stay in this 5 bedroom Ljubljana apartment you can be sure you’ll wake up fast when you enter the bathroom! The colors are very bold in this room which provides two shower cubicles and two toilets. The pink and white color scheme gives the bathroom a combination of modern and retro styling. The doors were custom made by a Slovenian glassmaker, Mr. Kramer, and the images on the doors are the same as those on the living room light. There are three high quality, custom-made wash basins here too, and the bathroom has underfloor heating, so although there is only one full bathroom in the apartment it is large and well equipped. There is, however, also an additional separate toilet. High ceilings, spacious rooms, large windows, wifi, Smart TV, a printer, PC, iPod stand with speaker, central /radiant heating, oven, coffee maker, microwave, washing machine and dryer. For the purposes of full disclosure, please be aware that there is no dishwasher and no air conditioning in this apartment, though with large windows to let the breeze in it is seldom needed. Check Availability and Book Your Stay in Our 5 Bedroom Ljubljana Apartment Now! If you’re planning a trip to Ljubljana with lots of family or friends then this Ljubljana accommodation will be perfect for you. As there are so few apartments of this size available in the city it’s wise to make your booking early to avoid disappointment, so contact us now to check availability and book. For an additional person please add 20 euros per night. Children under seven stay free of charge. Please note that a minimum stay for bokking Kristanova apartment is two (2) nights. We charge a cleaning fee for a short stay of two nights only. For Kristanova apartment we also charge a refundable security down payment in the amount of 100 euros, which we return at check-out, if the apartment is in perfect condition. Check out this fine FLA apartment: Holiday Home Ljubljana Rimska – Apartments for Rent in Ljubljana.